Grade 9 student Ashlyn Moody. Students, staff and community members gathered in the Blackville School gymnasium on Thursday, June 6 for the annual Recognition Day. Highest standing for both Middle School Language Arts and Math went to Sarah Manderville. Sarah Jardine won the Ron Pauly Memorial Award which recognizes a student who displays a positive attitude and a hard work ethic. Middle School Student of the Year went to Jensen Urquhart. The Most Improved Middle School Student Award went to Nicole Nash. Middle School Male Athlete of the Year is Tyler Gorbett and Middle School Female Athlete of the Year is Sarah Manderville. The Kathy McCormack Award, recognizing athletes who are great school ambassadors, went to Jordan Underhill. 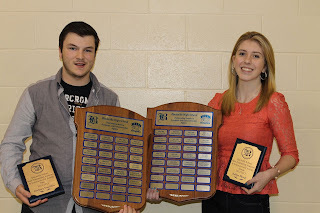 Daniel Underhill received Male Athlete of the Year while Female Athlete of the Year is Nicole Sullivan. Jackson Hallihan received the Fenton Sturgeon Memorial Award which goes to a grade 12 student who has been involved in sports for all four years of high school. Special consideration is given to students who have volunteered their time coaching younger athletes outside school hours. Most Outstanding Academic and Extra-curricular Awards went to Ashlyn Moody and Zachary Stockless.